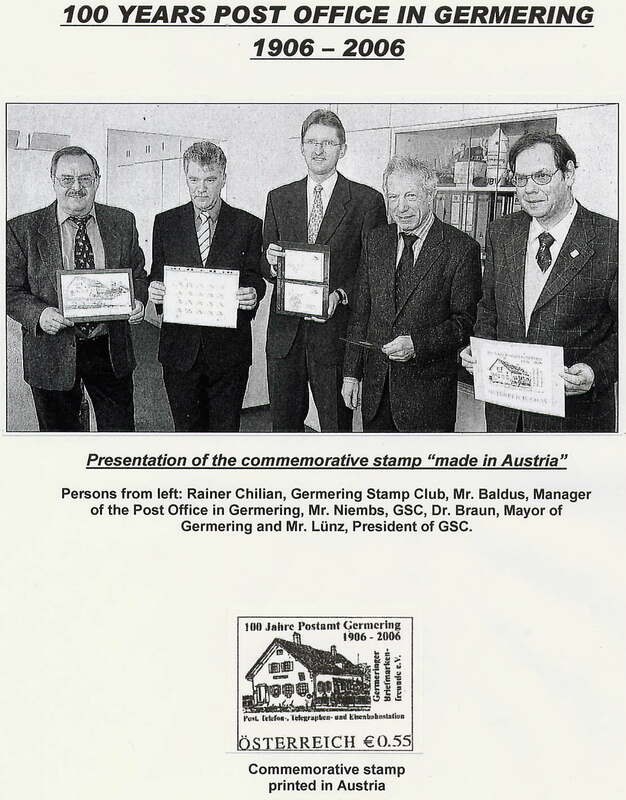 The Germering Stamp Club (GSC) is celebrating this special event with a commemorative Stamp printed in Austria. 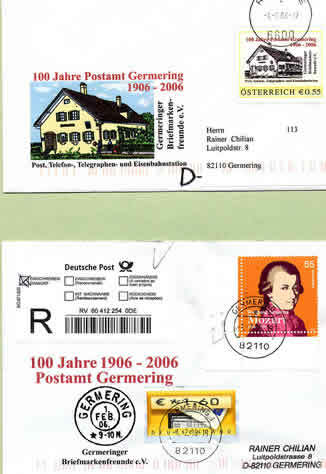 We ordered 500 stamps at the Austrian Post Office in Vienna and received them just in time for a cancellation on February 1, 2006, in Austria. The design was made by an artist and the motive is based on an old picture post card from 1910. We also designed different envelopes for this issue. We prepared 80 envelopes with the special stamp for mailing and I drove to a city in Austria, called Reutte (very near my hometown Füssen), which is approx. 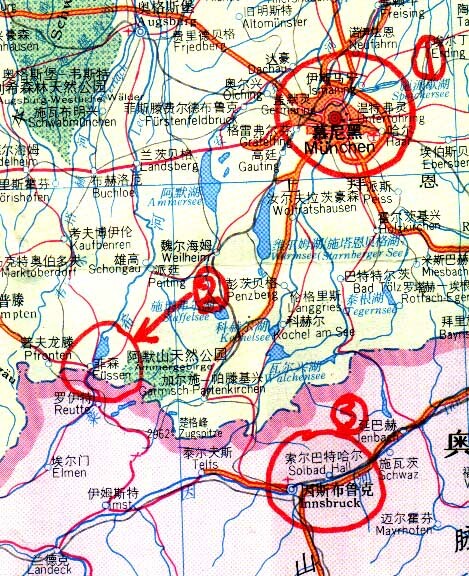 130 km south of Germering. The friendly people at the Post Office cancelled on Feb. 1, 2006 all envelopes and 2-3 days later they reached the senders in Germany. On the same day approx. 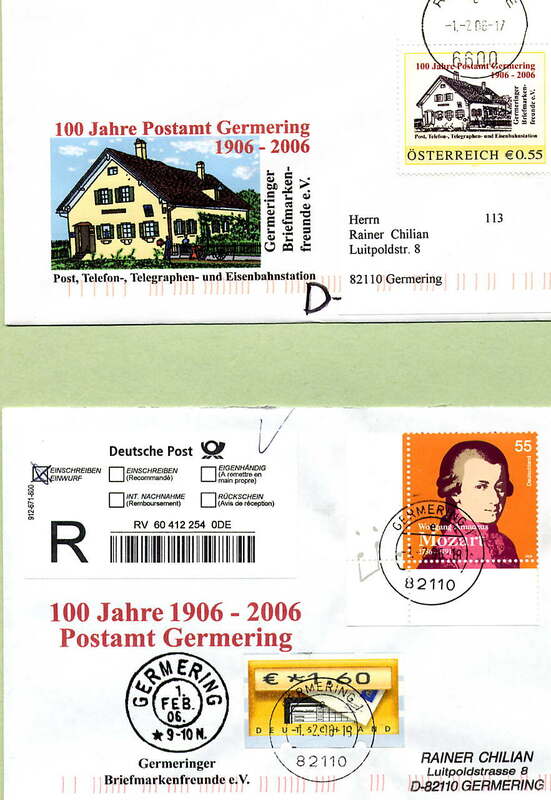 60 envelopes with German postage stamps had been cancelled at the Post Office in Germering. Why do we have to order a special personalized stamp in Austria and why can`t we get it in Germany? Since September 2003 it is possible to order personalized stamps at a value off 55 cent (postage for letter and postcard in Europe). The stamp is only valid in Austria (not in Germany) therefor it has to be mailed in Austria. The Austrian PO printed up till today approx. 8000 special stamps in very high quality. The profit from this business is very small, but they do it for image purposes and to strengthen their presence in the stamp market. Order for special stamps come from all over Europe and even Dubai. The German Post Office refuses to print special private stamps, because a stamp is the cultural embassador of a country and these stamps would not be up to their high standards. So we have only one choice - for personalized stamps we have to order them in Austria. Hope you like my presentation and you can use it in your web-site.